Other Places is a game inspired by the show Stranger Things, but also by the movies 9th Gate, the Craft, various other works of speculative fiction, and the Cthulhu mythos. In the game, the players are four kids who want nothing more than to have magical powers. They find a mystical tome that promises the power they're after. Instead of reading the entire thing they charge ahead and enact a magical rite which opens one of the Seven Gates of the Ancients. One of the kids steps outside the circle and is sucked into the Other, a realm where Things lurk in the dark. After their friend is pulled into the Other, the kids finish reading the tome. They realize they're magical powers have come at the cost of awakening an ancient force. They have started something that can only be undone by freeing their friend, returning the Ancient to it's slumber, and sealing the seven gates permanently. Unfortunately, the book they have can't do that. Meanwhile, it seems some Strangers have shown up in town. They're dressed in dark suits, and they're carrying guns, but they also have mystical tattoos. It's not entirely clear what their purpose is, but it seems as if they might actually seek to control the power of one of the 7 Ancients and release it out into the world. With only a hand full of townsfolk and there fledgling magic to stop it, the kids must save the world from the hell which they have unleashed. Strange things in other places are happening. It's up to you to stop them. 1. 7 Location cards are dealt out as show in the picture below, return the other 2 Locations to the box. 2. 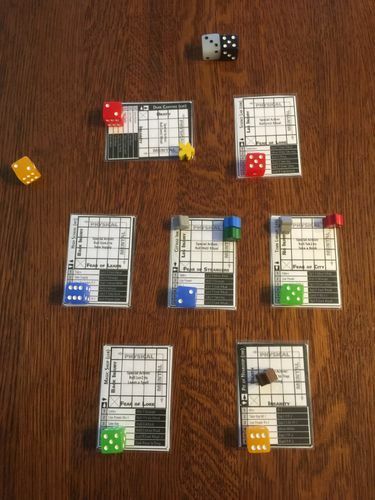 The 8 dice are rolled and then placed randomly on the 7 locations as shown, covering the bottom three results of the white Location Chart. 3. The remaining die gives the location of Open Gate. When counting locations do not count the center location. Count clockwise starting with the location in the top left corner. 4. Rotate the Open Gate Location so that it is sideways and then flip it over so the dark side is showing and replace the die to cover the three locked results in the white chart. 5. Randomize the Kid meeples and place one on the Open Gate Location card so that it's foot aligns with the far right, top box of the Health tracker. 6. Place all other kids randomly surrounding the Open Gate Location card aligned as well. 7. Place a Thing on the Open Gate Location card with the kid and place a Stranger on the opposite card. 8. The game begins with the kid who is on the top-leftmost Location card. The game has some work to be done still before it's ready for play testing, but I'm making real progress. We played it yesterday and there wasn't enough bad guy action going on. The players have to gather keys to unlock dice so that they can get supplies to build traps, take bikes to move more quickly across the map, and take radios to help their friend in the Other and give each other additional actions. They can also gain allies like the Sheriff who can clear out Strangers or the Scientist who can possibly return the Ancient to the Other with the right Chemical supply. Each round players may attempt to use their Magical Powers, as the gates open their magic will become more powerful, but the more gates that are open, the more they're likely to be sucked through them and the faster Dark Rituals are performed to open more Gates to finally release one of the Seven Ancients of the Seven Gates. This game is a little different than other mythos games. While the kids can possibly trap (and so remove the Strangers and Things from play) if the Ancient awakes, they're only chance to stop it is through reading books and enacting the Rite to return it to it's slumber. There is no fighting Ancients, you return it or the world is destroyed. The skill roll system is based on stats, with each Location being associated with a stat. The Library, for instance, is associated with the Learn stat. Each time you roll correctly on the location chart you gain an additional benefit, you can stop at any point after the first roll, but if you roll and fail you get nothing. Players are also trying to gain information about the rituals they must enact to Open Rifts to free their friends, Seal Gates to permanently close a Location, and return the Ancient to it's slumber. In order to do these, the players must also use the same dice that are used as keys or Items so they must sometimes choose between getting items or increasing their Ritual knowledge. Ritual knowledge may also be used to reroll a failed Skill roll or subtract one from the result. 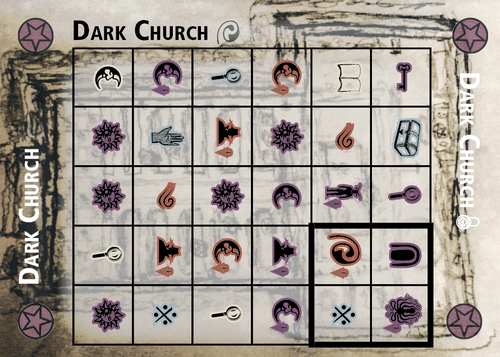 The black chart is the Dark Ritual chart. Each round, every Kid must make a roll on the Dark Ritual chart. This will cause Strangers and Things to move around the board, attack, and for the Dark Ritual Rites to advance. If the Dark Ritual is at 6 and advances a die is rolled and another gate is opened, sucking one kid in from that location if any kids were there. Movement around the board is a bit of a puzzle, because a player in the Other can move to an empty location that is not an Open Gate. The card is simply flipped over and the meeple returned to it's location on the Health Track. The same goes for kids in the real world traveling to Open Gate locations. They can be flipped over to the Real World side. The dice remain on the locked areas until unlocked. Again I'm still working out some of the mechanics and how exactly I'm going to make it all work with the limited resources, but I think I'm getting there. Any feedback or ideas are most certainly welcome. 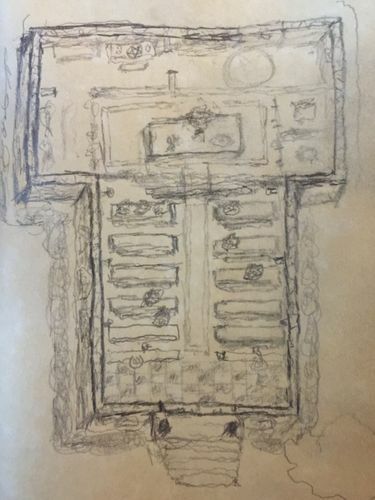 Here is an initial sketch of the Dark Church. I'm not much of an artist, but I think it came out alright. I'm trying to decide whether to filter them or not. 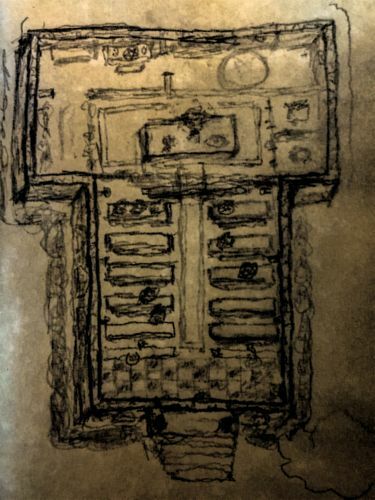 I plan on putting the sketches behind the Health Track, I'm trying to find different possibilities for configuration and possibly iconify the charts for Location and Dark Ritual events so they don't occupy so much space. It's a lot of information to fit on a single card. How's this coming along? This looks very interesting! Thanks! It has come a long a bit. I have had to set it aside to finish the Hook Box Challenge. I just finished up the rules and graphics on that a few hours ago after an all-nighter. Here's an image of the current card layout which is trying to take away the idea of concrete Physical/Mental Health and giving more of a descent into madness point of view. Each space that a player moves has an effect and a kid of a particular color that gets a free pass on those spaces. This would be the orientation of the card if the gate is open. The idea now is that dice would be placed on the square and locked in place until unlocked by accquiring a key. The symbols underneath would then be unlocked. Instead of just measuring health this is more of a grid of skill checks and movmement spaces for meeples. I haven't got it entirely figured out yet, but I've got some of the key pieces in place. I've also been experimenting with a logo for the game. What do people think of this? Is it readable enough? Is it too busy? Does it feel like it's missing something? I like it. It has a Asian/Indian look to it. Pretty good.